Baixa, literally translated as 'low', is situated in the gulf between the two main hills of the city and is the central business and shopping district of the capital. The 1755 earthquake and subsequent rebuilding by the then Prime Minister the Marques de Pombal are responsible for the orderly layout of this area, known formally as the Baixa Pombalina. Here a grid of straight streets lined with neoclassical buildings link up majestic squares and grand avenues, testimony to the genius of the Pombaline plan and widely considered an architectural achievement of great note in Europe at the time. The ground floor may contain a fashionable high-street store, one of the legendary Lisbon cafes like the Nicola or even one of the many establishments offering pieces of filigree Portuguese gold work on the Rua do Ouro or Rua da Prata (Gold and Silver Street, respectively). 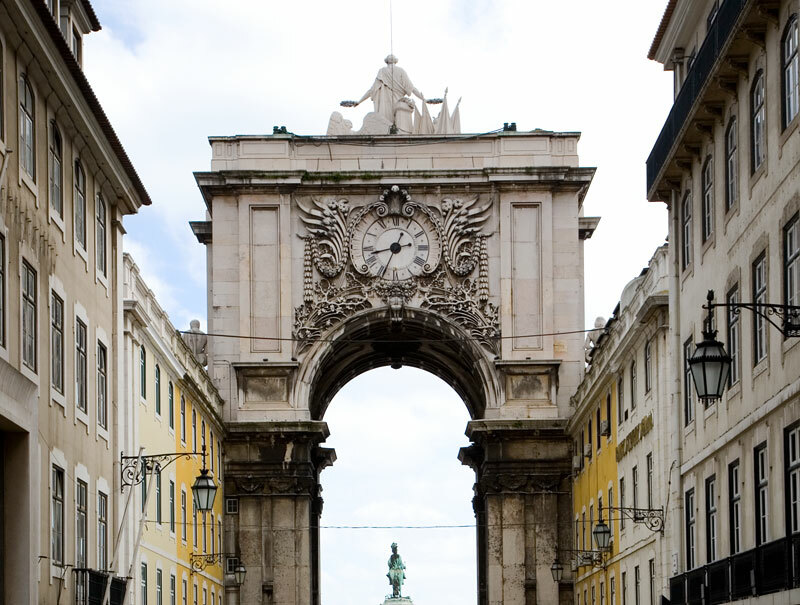 At the bottom end of the pedestrian and boutique-lined Rua Augusta artists and artisans peddle their wares to tourists and a triumphal arch leads onto the vast waterside Praça do Comercio. Once the site of the Royal Palace, this majestic square with its arcaded buildings and imposing equestrian statue of King Jose I is still a stunning sight, and also usefully houses the main tourist information point of the city. Don’t miss the 18th century Café Martinho da Arcada, frequented in bygone times by poets such as Fernando Pessoa and Almeida Garrett. 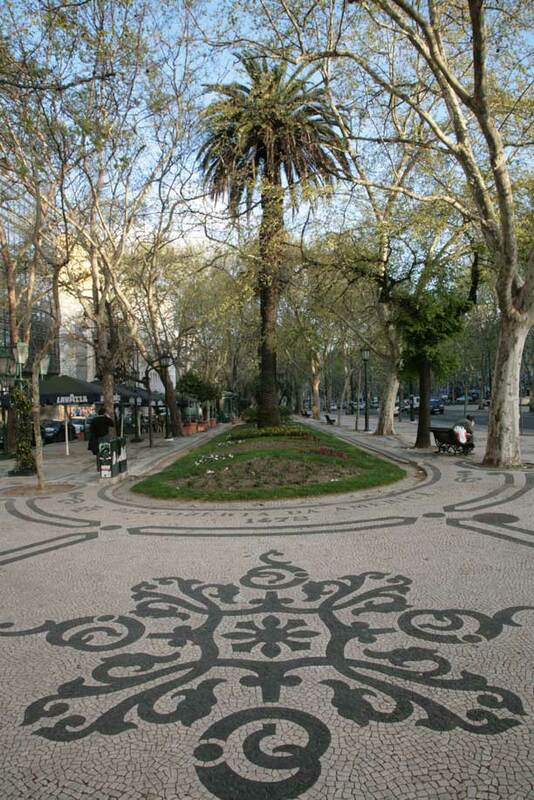 However, this is just one of the many elegant squares (praças) in the area. At the top of Rua da Prata, in the Praça da Figueira one finds the hugely popular Café Suiça and also the delicious traditional pastries at the Confeitaria Nacional, opened in the early 19th century and at the time widely considered to be one of the most elegant cake shops on the continent. Here it is a bronze King Joao I who sits astride his mount and forms the often pigeon clad centrepiece. 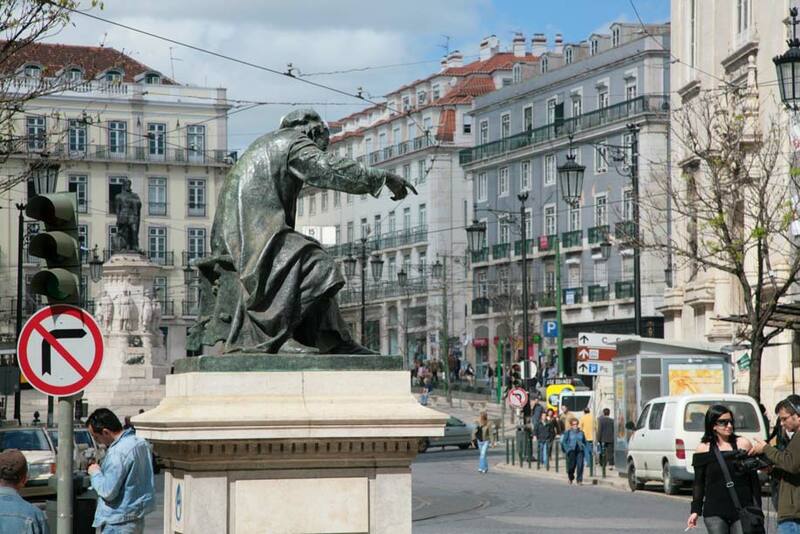 Just next-door is Rossio Square, or Praça Dom Pedro IV, the principal square of the Baixa. Dating from 1200 and once the scene of many an Inquisition torturing session, much was rebuilt elegantly in the post-earthquake era. The former Inquisition Palace was replaced by the Dona Maria II National Theatre, a fine building displaying a six-pillared portico and a statue of Gil Vicente, the classical Portuguese playwright credited with the foundation of Portuguese theatrical arts. The 18th century art deco Café Nicola also resides in the praça, another of the classic haunts of the Portuguese literati of old. Following the road away from the river, the beautiful Manueline building with its distinctive horseshoe-shaped doorways is neither palace nor mansion, but a train station offering trains to the fairytale town of Sintra. Beyond it is the Praça dos Restauradores, named after those who fought in 1640 to restore Portuguese rule and oust the Spanish – their bravery is honoured by a towering obelisk and two statues representing Victory and Liberty. Although seen all over the city, the black and white paving mosaics here are particularly impressive. On the west side of the square the famed Elevador da Gloria starts its ascent to Bairro Alto, to its side a fantastic pink palace which was once the residence of the Marquis of Foz now houses the national tourism office and beyond that again is the art deco splendour of the Eden Cinema. Now no longer a cinema, it is one of the few remaining buildings of its style along the Avenida da Liberdade, which flows out of this square towards the Marques de Pombal roundabout or Rotunda. This Champs-Elysees style boulevard was built exceedingly wide, which at the time seemed ridiculous but it now strains under the volume of daily traffic, thus confirming yet again the forethought of the destroyed area’s reconstruction plan. Despite the cars, it still retains air of elegance with its abundance of mansions, stylish shops, statues and fountains. The open-air esplanadas offer the opportunity of a coffee or lunch under the shade of trees. Just off the Rua do Ouro is Lisbon's most splendid elevador, once built to connect the low and high points of Baixa and Bairro Alto, now carries tourists vertically 45 metres to a café and a host of superb views of the city. 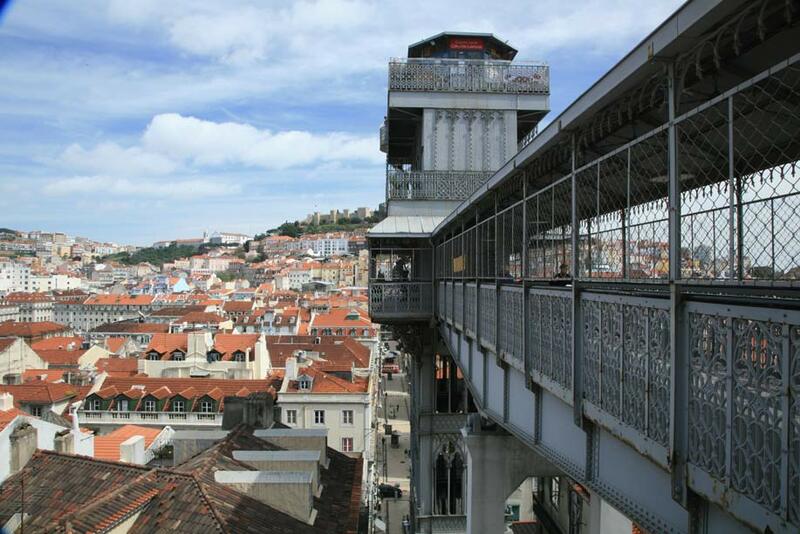 Built in 1902 by an apprentice of Gustave Eiffel, whose influence is quite apparent, this neo-gothic structure is known as the Elevador de Santa Justa or the Elevador do Carmo, owing to the Carmo church it used to link to. 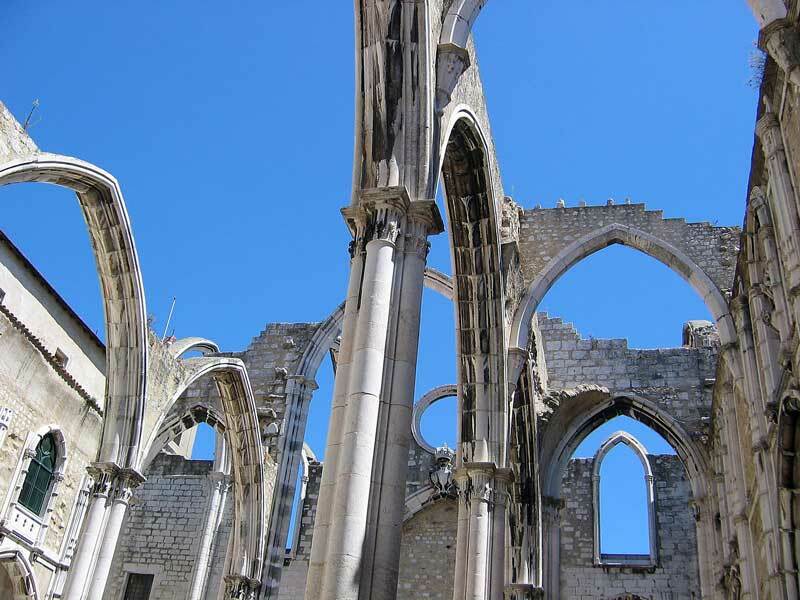 The ancient gothic Church of Carmo is one of the notable landmarks of the Chiado district, its skeletal structure left unaltered since its roof collapsed on a large congregation during the 1755 earthquake. One end is now an archaeological museum displaying a motley collection of treasures from royal tombs to shrunken heads and mummies from the new world, at the entrance to which lies an engraving stating that faithful Christians visiting the church are eligible to 40 days of indulgence, at the decree of Pope Clement VII. 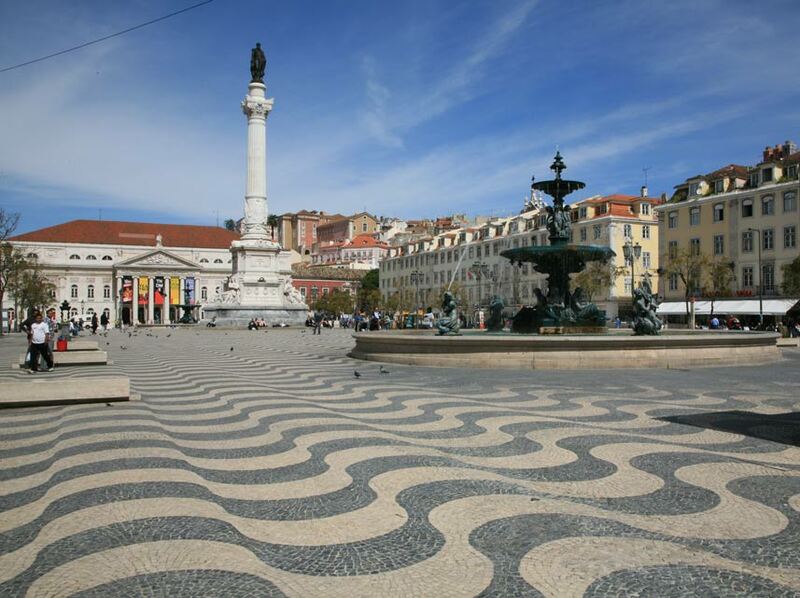 Chiado itself is a relatively small yet highly sophisticated quarter of the city. Its main street, Rua Garrett, runs upwards from the Baixa to Bairro Alto and for centuries has been home to prestigious shopping. Classical cafes and elegantly fronted shops mingle with theatres, art galleries and boutiques with names such as the global Hermes and Cartier and the more home-grown Ana Salazar, probably Portugal’s hottest fashion designer. The Brasileira Café at the top of the hill opened at the turn of the 20th century and always attracted an intellectual clientele, for example the poet Fernando Pessoa whose bronze statue still occupies one of the outside tables. At the bottom end of the street, the Armazens de Chiado, lovingly restored after being destroyed by fire in 1988, is a bijou but charming shopping centre, and many large high street clothing names surround it.